Love coffee, but don’t have time to read about each one? With so many coffees available, how do you know which is the best coffee for you? What will you like? How much do you need to order and how many cups of coffee will you get from a bag? These are just a few of the questions you may have when deciding upon the best coffee for you. Fear not. We are here to help in your quest. We have put together this guide of three simple options, all of which can help you choose the best coffee! Firstly, let us introduce you to our coffee wizard. This simple to use wizard will help you in your quest for coffee by asking just four questions. All our coffees have been crafted with particular times of the day in mind; morning, daytime and evening. For example, our current Colombian coffee has a dark fruit punch, making this ideal for the mornings when you do need coffee to punch you in the face. Next up, our El Salvadorian coffee ‘The Tiny Horse’ has a moreish biscuit sweetness making it a great coffee to drink all day. Finally, our decaffeinated coffee is perfect for the evenings, especially if caffeine stops you from sleeping. To change the answer click the underlined word and choose from the drop down. What do you like to make your coffee with? We like to know this so the wizard can recommend a coffee to suit. For instance, we wouldn’t necessarily recommend a bright, acidic coffee for an espresso machine. Why? We feel the pressure needed to create an espresso will heighten the acidity too much, often making it taste a little sour. Instead, the wizard would recommend something roasted a little differently. Hover over each brew method to select. If you are unsure, click the + button for more info about the different devices. Would you like coffee ground for your chosen device or whole bean coffee? 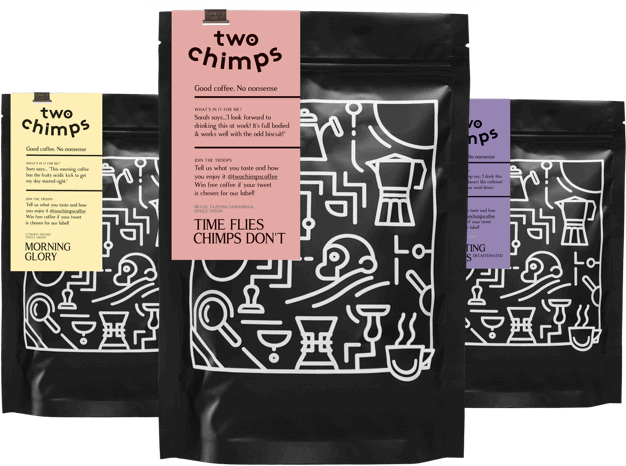 Here at Two Chimps Coffee, we offer a completely bespoke service. Offering whole bean or one type of grind size for ground coffee alone just isn’t cricket. We grind your coffee to match your particular brewing device, chosen above. Alternatively, we leave it in whole bean; the choice is yours. We have five grind sizes available, to match the five brewing methods above. Cafetiere, Pour Over (Filter), Stovetop, Espresso Machine or Aeropress. This is the last question the wizard will ask. With this information, the wizard will know the right frequency for delivery, along with the correct amount of coffee required. That’s it. All done. Just like that. The magical coffee wizard will suggest a coffee subscription based on your answers. It will even calculate how often you need a coffee delivery. Magic. Remember everything is delivered with FAST and FREE 1st class delivery. Never fear, you can scroll down to see the complete range too. We have six single origin coffees to choose from, along with our mystery subscription. Some of our coffees have been roasted lighter and have fruity notes with a bright acidity, while others are roasted slightly darker and have more chocolatey, often nutty notes. If you would like to ‘try before you buy’, then this option could be for you. You can order 50g coffee samples in any grind size to try first. These are also available with FAST and FREE 1st class delivery. Go on, order as many coffees as you like. Firstly, open the main menu. Use the carousel to scroll through the coffee tasters available. To find out more, click on a particular coffee. Here you will find a few photos from the harvesting farm, along with some brief tasting notes. Click the + next to FREE 1st class delivery to find out even more about a particular coffee sample. To open a particular title that catches your eye, click the + to the right. Find more detailed tasting notes, suggestions for brewing, the journey the coffee has travelled and how it was roasted to name a few. You can also find technical data behind each individual coffee by checking out ‘the nuts and bolts’. Lastly, choose your grind size, or leave your coffee sample in whole bean and we will do the rest. Do all of the coffees sound good? Then try our mystery coffee subscription. We send you a randomly chosen bag as frequently as you require, and in your choice of grind size – easy peasy! With the mystery coffee subscription, if you find a coffee that you just can’t live without, then give us a shout and we can make this your regular subscription. Or if you’d rather, just enjoy the selection of coffees that arrive on your doormat each time. Need a little help? No problem. Just Hola at the chimps; we are always happy to talk coffee. We can even help you to pick something totally awesome if you’d like. Ready to learn more? All of our coffees have a fantastic story to learn; for instance, where they came from and how they have been grown, harvested and processed. Find this story and more information in our online shop.